It barely seems possible that we are fast approaching the first anniversary of the UK’s ratification of the Hague Convention 1954. 12th December 2017 marked the entry into force of the Cultural Property (Armed Conflicts) Act 2017, which saw the UK, finally, making a formal commitment to adhere to the Convention’s obligations for the protection of cultural property in the event of armed conflict. One of the key obligations the Hague Convention requires of States Parties is to prepare in peacetime for the safeguarding of cultural property against the effects of armed conflict (Article 3). 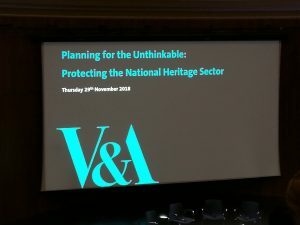 What this means, in practice, for the UK and its cultural institutions was the focus of the fascinating conference held last Thursday, organised by the Victoria and Albert Museum, in partnership with UK Armed Forces and the Department of Digital, Culture, Media and Sport (DDCMS). The conference brought together a broad spectrum of experts from the military, academia, NGOs, the Government and the security sector, who addressed the several hundred delegates lucky enough to take in the proceedings in the rather splendid surroundings of the V&A’s Lydia and Manfred Gorvy Lecture Theatre. The matters addressed were weighty and serious. What steps should cultural institutions be taking to prepare for possible acts of war and terrorism, or other environmental and natural disasters? What lessons can we learn from the past and from the experiences of institutions overseas? And a little more philosophically, what place does cultural property occupy in the theatre of war? On that final and perhaps most fundamental question, the position was clear. Whilst decisions about military objectives and the protection of human life must always take precedence, they cannot be wholly separated from considerations about cultural property. In the words of Professor Peter Stone, Chair of the UK Committee of the Blue Shield, the destruction of heritage sites and objects of culture, is “a human issue; it is about people”. The point was tragically illustrated by a sobering montage of photographs of colleagues of Professor Stone who had lost their lives in the conflict in Syria attempting to protect cultural property from destruction. In light of such tragedy and loss, it was heartening to hear of the initiatives already underway to step up the UK’s efforts internationally. Michael Ellis MP, Parliamentary Under Secretary of State for Arts, Heritage and Tourism, DDCMS, spoke of the projects currently being supported by the Government’s £30 million Cultural Protection Fund. Not only are these initiatives delivering increased understanding and knowledge but they are also fostering broader benefits such as jobs and economic security, helping to transform lives and communities. Discussions of the approaches taken by institutions in Dresden and Bologna to protect their collections during the two World Wars provided an interesting backdrop to thoughts about plans for the twenty-first century. Whilst times have clearly changed significantly, some of the thorniest dilemmas remain. For example, is protection better provided by concentrating moveable cultural property in small numbers of publicly known sites or dispersing it more widely across secret refuges? How do States address the problem of the illicit trade in cultural objects, undoubtedly the major driver of much of the looting and destruction across the globe? How do they categorise their cultural property? (On this question, the serious tone was lightened momentarily by one of the speakers quoting UK comedian Ricky Gervais who, when asked by an interviewer what he would save in a fire, pondered a moment before responding: “my guitar and one of the twins”!). No doubt the UK will grapple with these questions as it moves forward in its implementation and enforcement of the Hague principles. Whilst ratification in itself won’t provide the answers, it will at least propel the UK a few steps forward, as confirmed by the presentation by Keith Nichol, Head of Cultural Diplomacy, DDCMS. Mr Nichol gave an assurance, much to the relief of those listening, that the UK would not be leaving UNESCO (a deeply worrying prospect suggested by recent media reports) and explained that since armed conflict in the traditional sense was not considered to be high risk, the Government was minded to focus on what the UK can do internationally. He referenced the important new criminal offence of dealing in cultural property unlawfully exported from occupied territories and the key role which the Met’s Art and Antiques Squad will continue to play in enforcing this, and other relevant offences. The DDCMS is committed to raising awareness of the issues across the rest of the Government, and expects its message to fall on sympathetic ears given the strategic focus on enhancing the UK’s soft power on the world stage. A number of the speakers pointed out the perceived flaws and anomalies in the implementation of the Hague Convention historically. Without letting States Parties entirely off the hook, these are perhaps inevitable to some extent, given the extreme and changing nature of the situations the Convention covers. Whilst the particular risks posed by twenty-first century conflicts are very different from those of the 1950s when the Convention was drafted, the fundamental challenges remain broadly similar. Though they are undoubtedly daunting, there can never have been a more opportune moment for the UK to grasp the nettle and lead the way on the international stage. Emily Gould is Senior Researcher at the Institute of Art and Law. She writes, teaches and presents on a range of areas pertaining to art and cultural heritage law including copyright, heritage crime, museum ethics and contracts.